The meandering thoughts and observations of a Technology Engineer. As I write this it is with cramps in my hands. If you have never had ‘writers cramp’ you haven’t ever written more than 100 words at a go with a break. Personally I just got done with 5 thousand words for today, not including work. It’s insanity I know and I’m not even done with the novel that I decided to write this month, but it was a very good experience. Frankly I’m not even really that interested in the novel that I’m writing. I don’t know that I will go back to it. If you don’t know what I’m talking about, you have never done Nanowrimo, or you have never even thought of writing a novel I would suggest that you try it out sometime. It’s very rewarding writing out a story, even if incomplete, that is seperate from your own story, but uniquely tied to you. If you are interested here are some resources you can check out. First, Nanowrimo.org. This is the place where all the magic happens. They keep track of your progress, they will let you know if you won. They send you pep talks ever week and I’m sure they would pat you on your back or get you an ice pack for your tired fingers if you lived in Berkley, CA. Next, you should check this out “No Plot? No Problem!” It is a book written by Chris Baty the founder of the Nanowrimo event and continued supporter of writing and writing education. You can find it here: Amazon. 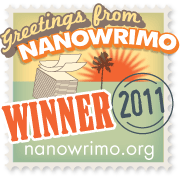 Last, the Office of Letters and Lights support programs like Nanowrimo and Scriptfrenzy (Scprit version of Nanowrimo). Chris Office of Letters and Lights to create a company around Nanowrimo and supports many schools and kids groups that help children get into writing. I wish that there had been a way to make me love writing more at an earlier age. Might have written 10 novels by now. Hope you all have fun with that, and hope to see you at next years Nanowrimo.